Dedicated to Arthur Lloyd, 1839 - 1904. Above - A Panorama postcard of St Enoch Square, Glasgow, around 1900, drawn from the entrance to St Enoch Station - Courtesy Graeme Smith. Of the many singing saloons and concert rooms in the 1850s, chiefly in the city centre around Trongate and the Saltmarket, the Shakespeare Singing Saloon was regarded as the premier one until the growth of Shearer's Whitebait Rooms in St Enoch's Wynd and Davie Broon's Music Hall in Dunlop Street. Both were near rivals, just off Argyle Street as it approached St Enoch Square. 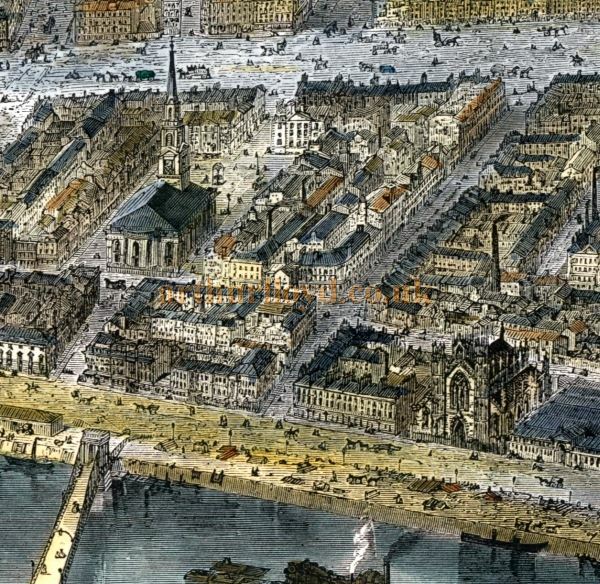 Right - View looking north across the Clyde over St Enoch Square and towards Argyle Street, from Sulman's Bird's Eye View of Glasgow 1864, showing immediately behind the east side of the square the buildings on St Enoch's Wynd and Lane, and reaching Maxwell Street - Courtesy Glasgow University Library. Later, both would be impacted by the arrival of a third railway terminal in the expanding city centre, this time at St Enoch's Square and operated by the Glasgow and South Western Railway, chaired by Sir James Lumsden, a supporter of many civic projects. All such concert rooms were soon to be outflanked by new purpose-built variety halls, starting in the 1860s with James Baylis's vast Scotia in Stockwell Street. Shearer and Brown did not confine themselves to Glasgow but each toured their own concert parties to towns such as Paisley, Falkirk, Stirling and Alexandria. The parties would each have around 10 singers and 5 musicians. When Arthur Lloyd toplined for each man in Glasgow he would also topline the tour party if it was in the booking period. In the zoomable town plans made available by the National Library of Scotland a Bartholomew map of 1869 shows the Whitebait close to St Enoch Square here, and not far to the east of it the Royal Music Hall of David Brown in Dunlop Street. A later map current around 1882 here shows the impact the new city railway terminals, including St Enoch Station, and railway lines had on the street scene, concert halls and Theatres. The Whitebait opened as a singing saloon at no. 16 – and later renumbered - in St Enoch's Wynd, off the south side of Argyle Street. The Wynd was parallel to the east side of St Enoch Square and to Maxwell Street and was busy. Over time, its buildings contained households - including the family of this writer - warehouses, bonded stores, printing offices, brassfounders, A&J Stewart's tube works (which became Stewarts & Lloyds, steel tube-makers) numerous workshops including watchmakers (continuing in today's Argyle Arcade, off Buchanan Street) and John Kirsop's hat manufactory, started in 1828, who were awarded the Royal Warrant, and were taken over by the House of Fraser. And there was a Night Asylum for the Houseless which can be seen here. Of a number of taverns, the Whitebait would provide entertainment for 400 people in its hall on the first floor, and had boxes and side rooms suitable for dinners and suppers etc. The ground floor was a store rented by others and the Whitebait building had frontage, and entrance, to the Wynd and to St Enoch's Lane. On the third floor was a large flat rented to the Morning Bulletin, a daily newspaper, as its editorial offices. The Whitebait Concert and Supper Rooms was started around the end of 1854, by the Telfer family. 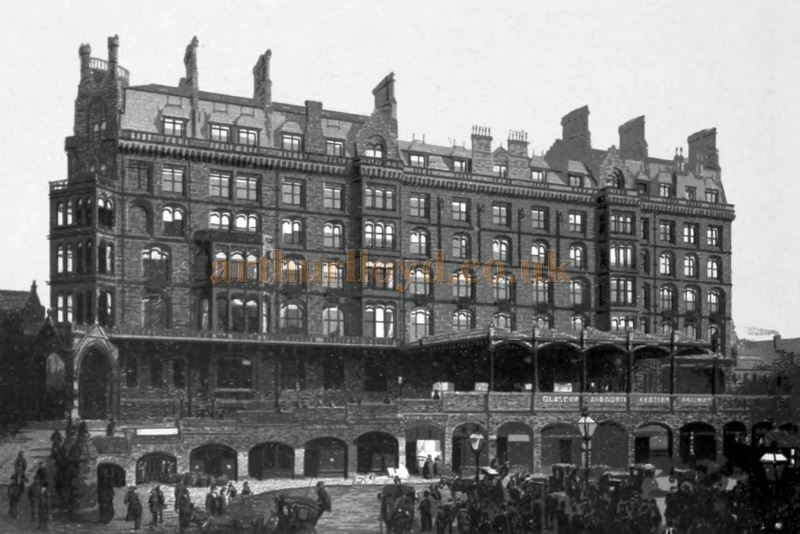 At the same time as leading architects proposed a West End Park and crescents of palatial houses on Woodlands Hill, west of Charing Cross, one of the architects, the respected James Smith of Blythswood Square, proposed a Union Arcade – similar to the Argyle Arcade, and starting opposite its Argyle Street entrance - taking over and demolishing the insignificant old properties in St Enoch's Wynd and Lane and creating a glazed arcade of fashionable properties and shops to Clyde Street, meeting the planned Suspension Bridge at the river, and on its way glazing the crossing over of Howard Street and Fox Street. The greater part of the property was acquired and an Act of Parliament obtained, but the scheme was abandoned. At this point Telfer opened the Whitebait in one of the properties bought by the Union Arcade Company. William Telfer ran a music warehouse in Queen Street. William and George Telfer, wine and spirit merchants who had taken out a 10-year lease of the Whitebait in 1854, and helped to expand it, were sequestrated in 1856 and the lease and goodwill of the Whitebait Concert and Supper Rooms were put up for auction with an upset price of £1,200. The Telfers had spent £1,800 fitting it up elegantly but ran out of money. Interestingly, they opened a new Whitebait in 1857, this time as Telfer's Argyll Whitebait Rooms at 21 Argyle Street serving food, and letting it be known the dining business was now the priority and not the entertainment business. It closed within a year. Right - A Glasgow Herald advertisement from 1857 for Telfers Whitebait Dining, Argyle Street, Glasgow - Courtesy Graeme Smith. 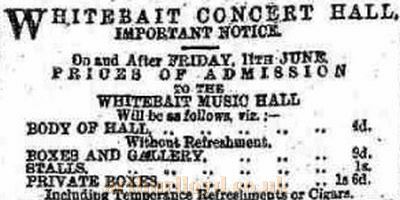 The Whitebait Concert Rooms were taken over in December 1856 by James Shearer, wine and spirit merchant, who had experience of music halls in Ireland. He was born in 1824 in Ballymena, Co Antrim, the son of a leather merchant David Shearer and his wife Mary Shearer. James married a Glasgow lady, Elizabeth McKay, and some of their children were born in Scotland and some in Ireland. James Shearer was also owner-manager of the Imperial Colosseum Concert Room, 30 High Street, Belfast from his opening of it in December 1854 until the end of 1856. On his moving to Glasgow many performers who had long runs of several months at the Whitebait would then go on and do likewise at the Imperial Colosseum, and vice versa, well into the 1870s. Mr Edward Shearer, his brother, continued to run and then own the Imperial Colosseum from 1857 onwards, until his death age 38 in Belfast in December 1864, with the venue still being referred to as Shearer's Imperial Colosseum. His widow Mary Shearer, now at 2 Graham's Entry, Belfast had the spirit licence transferred to her in 1865. She continued to perform on stage there. She announced her retirement at the end of 1871 and the music hall was advertised for sale in 1872 following her death and was taken up by George Wallace and others. In January 1873 the alcohol licence transferred from the name of Mary Shearer to Francis George Taylor. After Taylor's bankruptcy in 1875 there were changes of name, enlargement, and ownership. It was acquired in the 1890s and rebuilt as the Empire Palace by the Findlater family, owners of the Findlater chain of grocers, brewers and whisky distillers in Dublin, who came originally from Scotland, where they were friends and supporters of the poet Robert Burns. 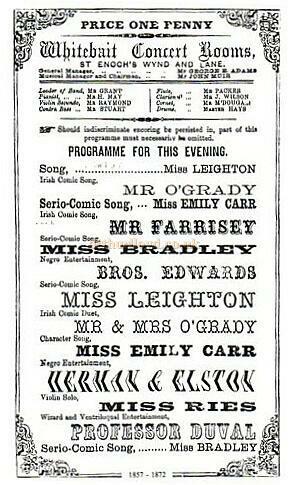 The emerging Empire in Belfast (and their Empire Palace, known today as the Olympia, in republican Dublin) was programmed by the Moss Empire group and was owned and directed by the Findlaters for over 60 years. More about the Findlaters can be seen here. Right - An Evening Citizen advertisement in June 1867 for the Whitebait, St Enoch's Wynd, Glasgow, headlined by Arthur Lloyd - Courtesy Graeme Smith. In 1861 Arthur Lloyd made his debut in the Whitebait, which like others was recovering from diversion of audiences to the Volunteer Rifle Movement. He returned frequently, and helped Shearer prosper. In 1864 the Whitebait was remodelled and now contained a gallery (by taking over the newspaper office above) in addition to the pit, stalls and boxes. Shearer's band was available for Balls and Assemblies. The Glasgow Herald reported upon the architecture of the improved Whitebait in their July 1864 edition saying:- 'As Mr. Brown's "Philharmonic" has been superseded by the "Royal Music Hall" in Dunlop Street, so Mr. James Shearer's old and much too restricted "Whitebait Rooms" have given place to an elegant and commodious hall under a similar name, and on the same site. The transformation here is pleasing and complete. The heavily elaborated square beams, ponderous brackets, stucco figures, and ornamental plaster-work of the old hall, which were calculated to retard sound, have now been replaced by a saloon of elegant design and chaste decoration. Entering the area, we look round upon a pretty and compact hall, the ceiling of which is arched transversely, its length being divided on either side by delicately-wrought open arches and supported by columns with ornamented capitals. An enriched entablature supports the ceiling, which is pierced with ten lights fitted in with pictures in transparent glass, illustrative of different emblematic subjects. The stage is painted in colours and profusely gilded, and on the upper fiat directly opposite the stage is the balcony, with the green-room underneath, both apartments being expensively and elegantly ornamented with stained glass, the decorations of the hall and the stained glass having been executed by Messrs. Hugh Bogle & Co. under the direction of Mr. David Haire, of that firm. The hall is brilliantly lighted, and sufficiently ventilated; and we need only add that, with industry and the employment of the best talent, Mr. Shearer is already enjoying a very fair measure of public favour.' - The Glasgow Herald, June 1864. For a number of years the general manager – and a comic vocalist himself, and his wife a vocalist and dancer - appointed by James Shearer, was George Ware, and in that position was also sole-agent for the Imperial Colosseum, Belfast; followed by a duo of: George Adams general manager and James Muir musical manager, who also deputised as evening chairman, would continue in the 1870s. A "Champion Comique" Sold at Auction. Messrs Hutchison & Dixon's auction hall was the scene yesterday of a unique gathering and unique sale. A champion comique—Mr James Taylor—offered his services for four months to the highest bidder, binding himself to perform twice every lawful evening during said period, and to sing no less than two nor more than four songs on each appearance," the engagement to commence on 5th Nov. 1866. Numerous professionals, saloon habitues, and sporting Glasgow generally, accompanied by its having assembled to see him sold, lunged about the hall, perfuming it with the unaccustomed odour of cigars and chatting with the absence of social stillness and that racy unreserve which marks Bohemianism everywhere. Mr Robt Hutchison, who acted as the Joe Robins of the occasion, in a harmonious little address, spoken to the accompaniment of champagne amongst the company, introduced the article for sale. The appearance of Mr Taylor's dapper little figure and merry face elicited hearty cheer. The conditions of purchase having been read over, some maladroit individual called out for song from the object of sale, whereupon another, in gentlemanly vinous state, rose, and in some incoherent words, the precise drift of which could not first be seen, expressed the opinion that they had—hadn't come there to hear a performance." The company approved the sentiment, and the sale commenced. Mr George Ware (Whitebait Saloon) thought Mr Taylor was worth 100 guineas L. 120 some one else bid. Mr David Brown would say L.150 at once. (Hear, hear.) L.160. Mr Brown—L.,200 for the Royal. Mr George Ware—L. 210 for the Whitebait. (Laughter.) L for the Britannia. Mr Brown—L.240. Mr Shearer (Whitebait) —L. 250. The suggestion here made, and unanimously agreed to, that the company should breathe a little and have some champagne. Everybody having "liquored up," the bidding proceeded in rival tens up to L.310, when the company again took breath—to use an expressive Americanism— Mr James Taylor here observing that a few more fivers would pay the score. The bidding thereafter went on by cautious fives, culminating finally in L.335—Mr Shearer, of the Whitebait, for this sum becoming possessor of Mr Taylor's services for four months. Shearer died of the dropsy, age 45, in March 1868 at home in 140 London Street, Glasgow, leaving his wife Elizabeth a widow with seven children. He was insolvent, owing some £2,500 which may have included a loan to develop the Whitebait. However, his trustees worked very well, and over three years all creditors were paid off, and an annuity of £300 to £400 was established for Mrs Shearer, who was now owner of the business. In February 1869 a major fire next door at 20 St Enoch Wynd destroyed the three-storey building occupied by Messrs Filshill & Co, manufacturing confectioners (a company which continues today) but the fire brigade stopped its spread to the Whitebait which stood on its northern boundary, apart from the melting of some of its roof lead. The Whitebait continued under Mrs Elizabeth Shearer's ownership until 1875 when despite the police recommending renewal of her drinks licence the magistrates refused to do so. Right - A Glasgow Herald advertisement from June 1875 for the Whitebait, St Enoch's Wynd and its temperance admissions prices - Courtesy Graeme Smith. JAMES LAIRD has received instructions from the City Union Railway Company to Sell the above, by Public Auction, commencing at Twelve o'clock. Mrs Shearer passed on in 1908, age 82, in her coastal villa Avondale, Helensburgh. The above article on the Whitebait Music hall, Glasgow was kindly written for this site by Graeme Smith in June 2018. Above - St Enochs Station and Hotel - From an Album of Photo-Lithographic Views of Glasgow published in 1911. The Station and Hotel replaced the former Whitebait Music Hall and the Theatre Royal Dunlop Street. Right - A Bill for the Whitebait Music Hall - From the book 'The Scottish Music Hall 1880 - 1990' by J. H. Littlejohn, published by G. C. Books, 1990 - Courtesy Gareth Price. In J. H. Littlejohn's 'The Scottish Music Hall 1880 - 1990' he writes on the Whitebait saying:- 'The Whitebait Concert Rooms in St. Enoch's Wynd started out in 1857 as a free and easy before the tables were replaced by stalls in the body of the hall. Admission cost 6d with a free refreshment or cigar thrown in for good measure. Credited with pioneering "girlie" shows with all female casts working behind a wire for their own safety, James Shearer managed the Whitebait until 1868 when his widow took over. John Muir, who was chairman and musical manager of the orchestra combining piano, violin, bass, flute, clarinet, cornet and drums, forewarned audiences that indiscriminate encoring would result in part of the programme being omitted. There is no record of the frequency with which this sanction was enforced until development of the railway system necessitated closure of the Whitebait in 1872.' - J. H. Littlejohn's 'The Scottish Music Hall 1880 - 1990'. 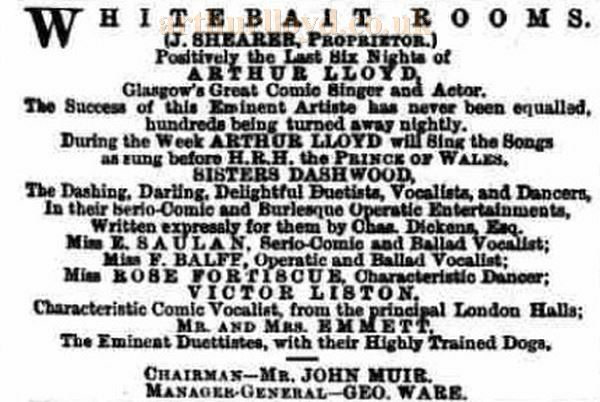 Arthur Lloyd performed at the Whitebait music Hall many times, and his father Horatio Lloyd was a regular performer at the Theatre Royal Dunlop Street which was also lost in 1869 for the building of St Enoch Station. In Horatio Lloyd's autobiography he wrote of the Dunlop Street Theatre saying:- 'Could Alexander revisit the site of the theatre of which he was so proud, he would be strangely bewildered. Neither theatre or Arcade is there. Dunlop Street is, for the chief part of it, now but a tunnel over which the trains of Glasgow and South-Western Railway run into the terminus station of St Enoch Square." - From 'Life of an Actor' by Horatio Lloyd. If you have any more information or images for this Theatre that you are willing to share please Contact me. To enhance the visual experience on Mobile Phones and Tablets some elements of this website have been removed for smaller screens, see the FAQ for details.